Joseph Stiglitz, former World Bank economist, member of the Council of Economic Advisers was awarded the Nobel Prize in Economics in 2001, just months after the September 11th attack of the twin towers in NYC. The following are his concluding remarks in his acceptance speech (December 8, 2001). I entered economics with the hope that it might enable me to do something about unemployment, poverty and discrimination. As an economic researcher, I have been lucky enough to hit upon some ideas that i think do enhance our understanding of these phenomena. As an educator, I have been lucky enough to have had the opportunity to reduce some of the asymmetries of information, especially concerning what the new information paradigm and other developments in modern economic science have to say about these phenomena, and to have had some first rate students who themselves pushed the research agenda forward. As an individual, I have however not been content just to let others translate those ideas into practice. I have had the good fortune to be able to do so myself, as a public servant both in the American government and at the World Bank. We have the good fortune to live in democracies, in which individuals can fight for their perception of what a better world might be like. We as academics have the good fortune to be further protected by our academic freedom. With freedom comes responsibility: the responsibility to use that freedom to do what we can to ensure that the world of the future be one in which there is not only greater economic prosperity, but also more social justice. Stiglitz has been busy since receiving his Nobel and is currently University Professor of economics at Columbia University. He has been outspoken in his critique of inequality and neoliberal economics including our narrow concept of development.Increasing inequality and climate change are perhaps two alarm bells that have helped more economists join with Stiglitz and others to note the ills that the neoliberal economic policies have wrought. Maybe no one makes this more clear than Naomi Klein in her just released This Changes Everything. Klein, who has spent most of her time focusing on the neoliberal economic impacts of globalized trade, has come to see how the worldview associated with climate change denial is fundamentally tied to neoliberal economic worldviews. It’s not that the companies moving their production to China wanted to drive up emissions: they were after the cheap labor, but exploited labor and an exploited planet are, it turns out, a package deal. A destabilized climate is the cost of deregulated, global capitalism, its unintended, yet unavoidable consequence. 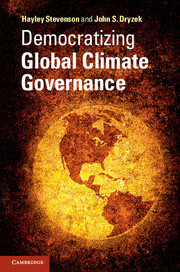 Political scientists, John Dryzek and Hayley Stevenson, try to see how we might come to some global agreement on how to address climate change in their new book, Democratizing Global Climate Governance (2014). They are less concerned about the climate deniers, since they are a tiny minority, especially of those who attend the global climate meetings they have studied. Dryzek and Stevenson instead look at the variance among those trying to wrestle with finding some sort of global agreement at four recent international meetings. Their findings lead them to identify four different frames (they call discourses) of orientation to addressing climate change. 1) Mainstream Sustainability – which assume that natural relationships are both competitive; partnerships; and win-win and in which economy is related to conservation. Business is seen as seeking profit with a conscience, governments believe in ecologically benign economic growth. They believe in the market’s ability to manage climate response. 2) Expansive Sustainability – which assumes the possibility of international equity, a sense of responsibility, and that competition could be fair. They believe that civil society is a major player looking for the common good and that states have material motives but are share common but differentiated responsibilities. 3) Limits – assumes humans are dependent on the non-human world, rejects GDP, sees ecological limits, and development that is not growth. States are self-interested with unsustainable policy goals, but they are potentially capable of enlightened self-interest. 4) Green Radicalism – assumes that there is an inter-connectedness between humans and non-human worlds, that humans are capable of cooperation and solidarity. They see states and corporations are irresponsible, that mainstream environmental groups are ineffective. These four views clash at the global meetings around climate with the bulk situated between expansive sustainability and limits. These findings seem to dovetail with recent published research showing that facts don’t matter as much as the orientation one brings to the table. Perhaps the follow-up question is one that examines what leads anyone to question their basic assumptions about how the world works? Meanwhile the evidence mounts that the climate and our economy are linked. Will our elected and other leaders figure this out in time.